02 Mar Congratulations to our 2015 Early Bird Winner, Bethany McIntyre! 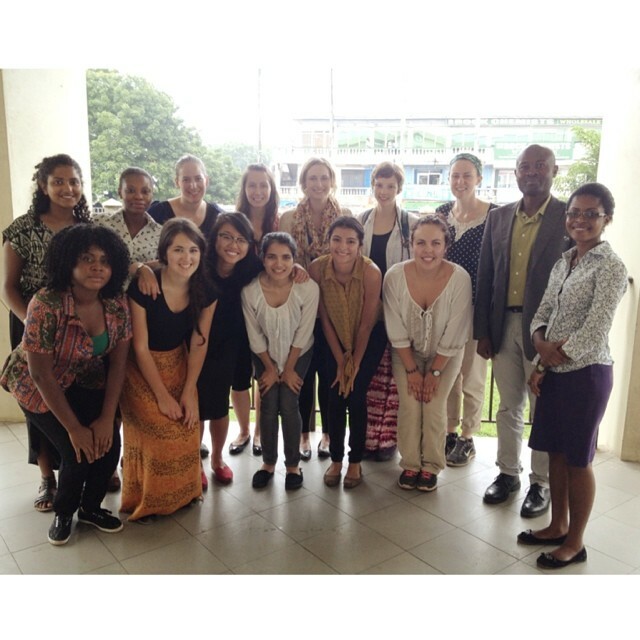 Written by Sarindi Aryasinghe and Kali Burnell, 2014 West Africa: Global Health Program Leaders. During our stay in Accra, we were staying with Mama Tina and her family by Danquah Circle, Osu. Everyone was more than happy about the running shower, the close Internet cafés, and the busy local vibe. Our adventure started with a visit to Korle Bu, the largest teaching hospital in West Africa. It was a life-changing visit as we witnessed the lack of supplies and the number of emergencies. After our tour, we attended a meeting with the National AIDS Control Program, where we learned about all the preventative measures being taken as well as in-country progress. Our night ended with a food hunt, where we tried for the first time some of the local dishes: fufu, banku, rice balls, and waakye. We ate traditionally around a table and ate with our right hands.